This article is for archive purposes. 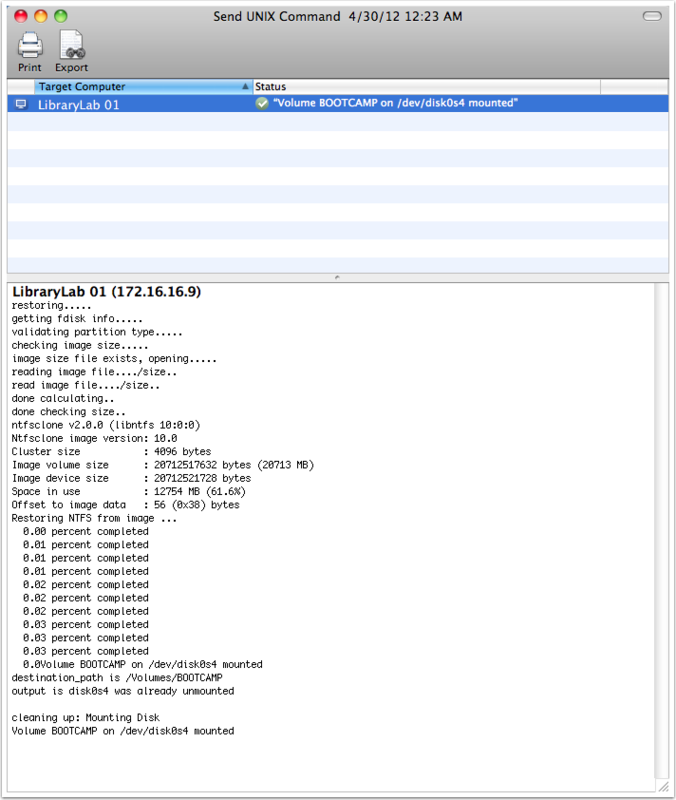 The current recommended method of mass deployment with ARD is using the package installer. Please refer to the package installer documentation. You can adapt this guide to your specific needs. As examples, if your Macs already have two partitions, you don't need to use ARD to create an additional partition, and if your Winclone image is already part of your Mac image, you don't need to use ARD to copy it to your remote Macs. Open Winclone Pro and choose your Winclone image in the sidebar. If your Winclone image isn't already in the sidebar, you can drag it there from the Finder. From the Tools menu, choose "Make Self Extracting". This creates a perl script that you can later use to extract the image. This means that you don't need to install Winclone on the remote Mac. At the "Make Self Extracting" window, click Copy. After a brief moment, you see the Completed window. Click OK.
Verify that Winclone Pro actually created the perl script. 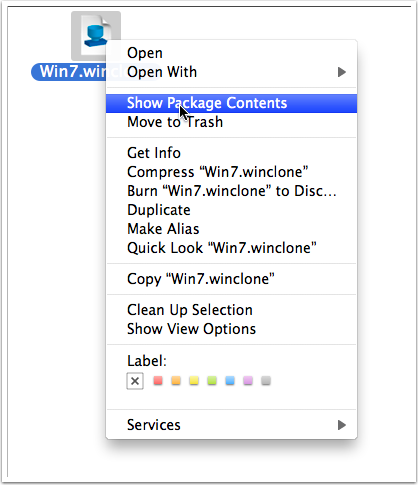 In the Finder, Right-click (or Control-click) your Winclone image, and choose "Show Package Contents". You will see a new folder in the Finder. 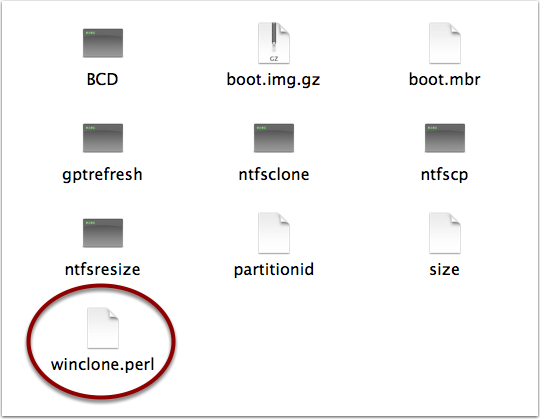 In this folder, confirm that the item "winclone.perl" exists. You can close this Finder window. One advantage of using ARD to copy Wiclone is that if you select multiple Macs, ARD attempts to use multicast to perform the copy to preserve network bandwidth. Drag your Winclone image to the Copy Items field. Click the Place items in field, and choose an appropriate location. In this example, it is "Top folder of the disk", also referred to as the root of the volume, written as "/". You may decide to go do something else while the copy takes place, because it could take a while. Use ARD to create an extra volume for the Windows volume. Choose your remote Mac. Click UNIX in the toolbar. The forward slash, /, is the command-line way of referring to the boot volume. Even if your Windows volume will ultimately be NTFS, specify MS-DOS for now. Use all caps for the Windows volume name. Leave the MS-DOS partition size at zero, so you don't have to calculate anything, and OS X automatically uses the remaining space. Use the number zero, instead of a capital letter, in "0b". Enter the command in the window. Click User to "Run command as"
Enter "root" in the User field. ARD opens a new window with the progress of your UNIX command. While this won't take as long as copying the image, it could take more than a few moments. Some space (209.7 MB) is taken up by the EFI volume. Some space (650 MB) is taken up by the Lion Recovery volume. 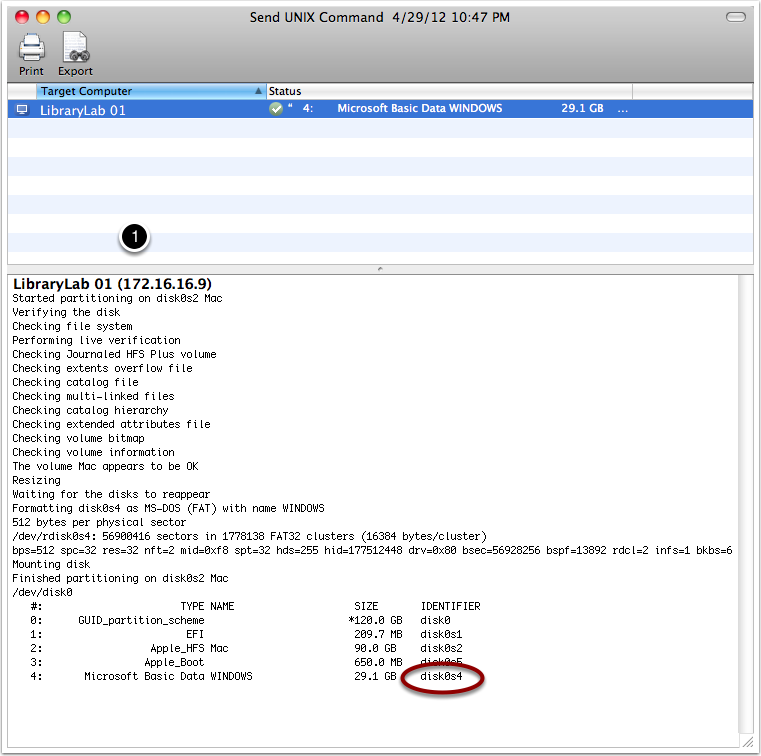 In the following example, the raw disk size is 120BG, 75% of the disk is taken up by the OS X volume, some is taken by the EFI and Lion Recovery volumes, which leaves around 24% of the disk for the Windows volume. If you really want to fine-tune the settings when you run diskutil resizeVolume, go right ahead; using 0b for the size is a quick shortcut. Note the device identifier for the newly created Windows volume; you'll need it soon. In this example, it is disk0s4. Jot the device identfier somewhere, and close this results window. Prepare to send the winclone extraction command. Close the results window from the previous step. In the ARD main window, select your remote Macs. 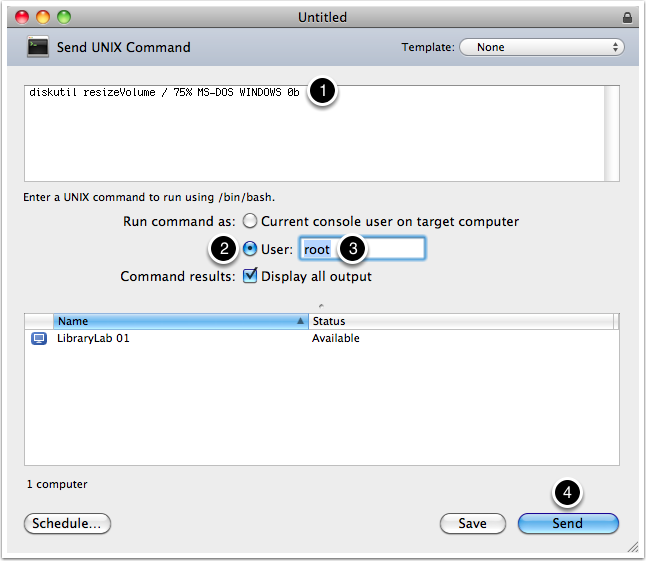 Click Send UNIX in the toolbar. cd, followed by the path to your Winclone image (in this case, the Winclone image as at the root of the Mac volume, written as "/", and the name of the Winclone image is Win7. 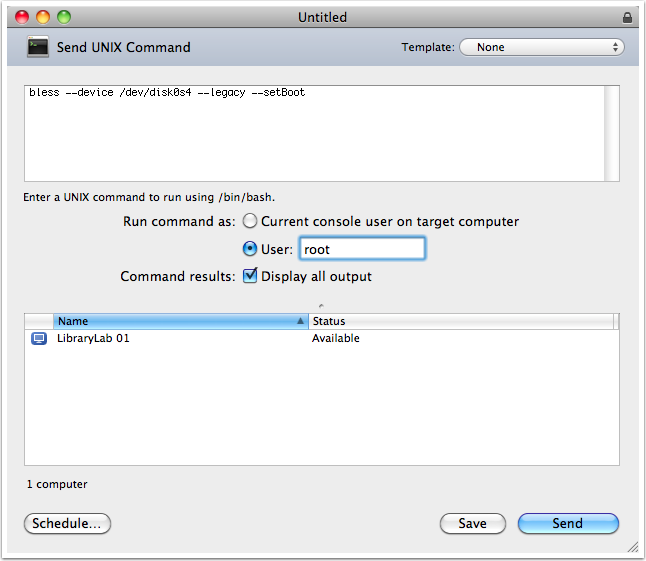 the semicolon, to indicate they after you change directories, you'll run the following command while in that directory. ./winclone.perl; be sure to type the period, then the forward slash, then winclone.perl, with no whitespace inbetween these characters. The period indicates the current directory. -q to suppress the warning question; you cannot answer a question interactively with the ARD Send UNIX Command. -image_dir=. so that Winclone knows where the image source is; again, the period indicates the current directory, which you specify in the first part of the command you enter. Double-check to make sure that your command is written like the example, with white space between elements of the command only where appropriate. Click User to "Run command as". 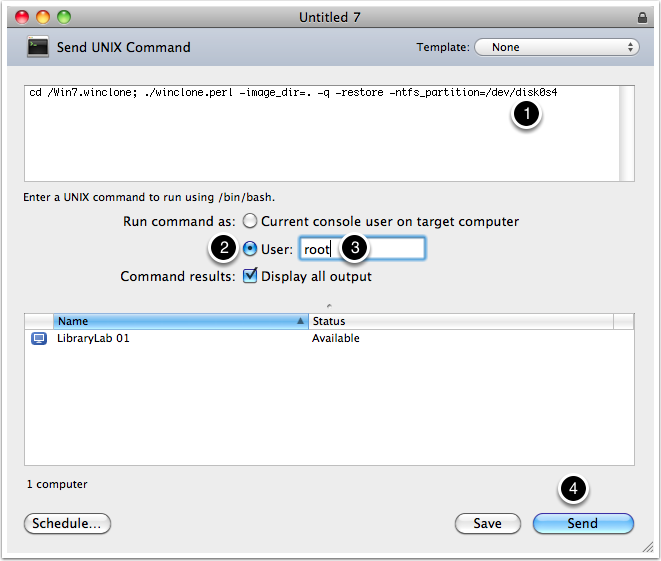 Enter "root" in the "Run command as User" field. It may take a while for the Winclone image to complete restoring. Currently, winclone via ARD doesn't give much progress information. 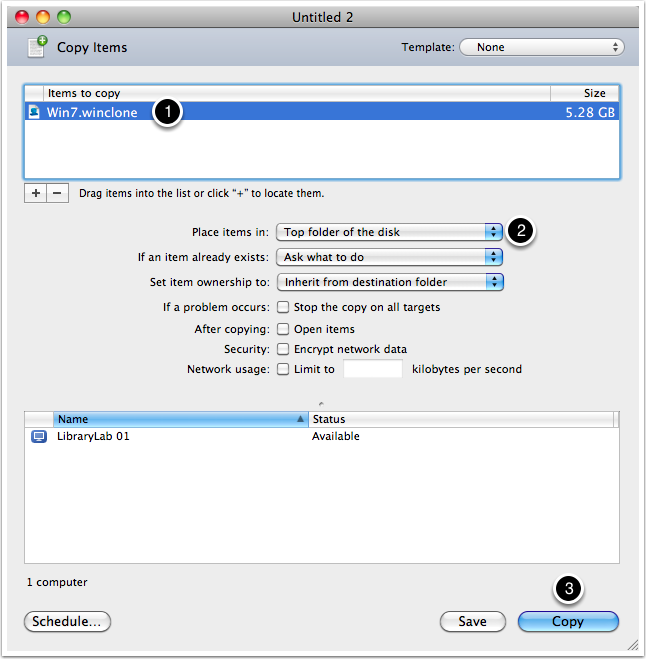 You could open the Activity Monitor on a remote Mac, then clck the Disk Activity tab to monitor disk activity. When the restoration is complete, the ARD results window contains information that the volume is mounted. Don't worry that the "percent completed" section is incomplete in the results section. Focus instead on the fact that it is mounted. You can close this results window. If you don't need your Winclone image hanging around, remove it from your OS X volume. 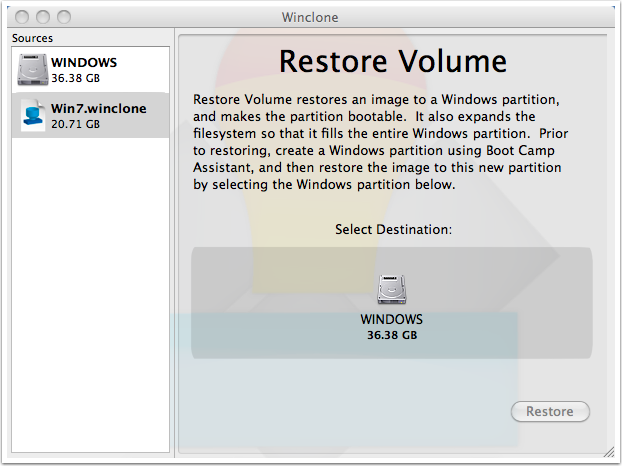 However, if you re-image the Windows volume often, consider preserving the Winclone image on the remote Macs. In ARD, choose your remote Macs, then click UNIX in the toolbar. Click User, and enter root. 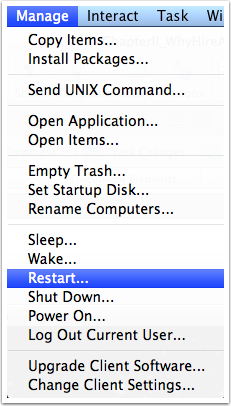 In the ARD main window, select your remote Macs, and then from the Manage menu, choose Restart. Article published: April 21, 2017 03:13 . Article last updated: April 21, 2017 03:13 .